Mariners catcher Mike Zunino realized quickly it was one of those days when it really didn’t matter what pitch he called. 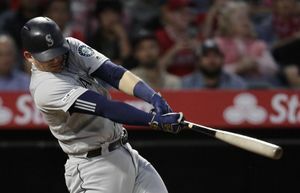 All were kryptonite to the Cleveland Indians on Sunday when thrown by Felix Hernandez, who allowed just one hit in eight innings in leading the Mariners to a 3-0 victory in front of 26,171 at Safeco Field. In fact, Hernandez was only a foot or so away from being in position to throw another no-hitter — he tossed a perfect game here against Tampa Bay in August 2012. Cleveland’s only hit came leading off the fifth inning on a slow roller up the middle by Lonnie Chisenhall that just eluded the slide of Mariners second baseman Robinson Cano and skidded into center field. “It happens,” Hernandez said later, expressing no regret about the near-miss. With Seattle holding a 3-0 lead heading into the ninth and Hernandez having thrown 107 pitches, he was lifted in favor of Fernando Rodney. The closer pitched a perfect final inning to complete a rare 24 hours at Safeco Field. Cleveland’s Josh Tomlin one-hit the Mariners in a 5-0 win Saturday night, the first time since April 25-26, 2013, when one-hitters were thrown at the same park on consecutive days (the Washington Nationals against the Reds at Nationals Park) and first time in an American League stadium since 1996 (the Rangers against Detroit at Tiger Stadium on May 3-4). McClendon said Hernandez would have stayed in had he had a no-hitter but said there was “no discussion” about pulling him after eight. “Just based on what the manager felt,” McClendon said. Hernandez, who has one career one-hitter, at Boston in 2007, along with the perfect game, said he had no issue with the decision. By that point, the Mariners had a comfortable lead, thanks largely to Cano. The Mariners were handcuffed by Indians lefty T.J. House through five innings. Michael Saunders, though, led off the sixth with a nibbler in front of the mound that House threw away at first, allowing Saunders to get to third. On the next pitch, House threw high and tight to Cano, who admitted later he didn’t like it much. 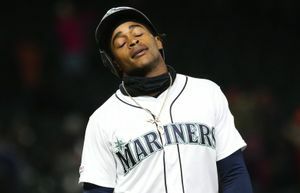 Two pitches later, House left a slider up and Cano blasted it 351 feet into the right-field bleachers to give the Mariners a 2-0 lead and also snap Cano’s 0-for-14 skid. Cleveland manager Terry Francona said he knew then the lid might have shut on his team’s chances to win. “The way Felix Hernandez threw, any mistake makes it really difficult to win that game,” Francona said. Cano then led off the eighth by beating out a high chopper to second and scored on a single by Zunino to make it 3-0. Otherwise, the game was all about Hernandez, who had nine strikeouts, five called, and walked three. Hernandez said his fastball, which at times touched 95 mph, was especially good. McClendon said he thinks some of that is due to Hernandez at times this year getting an extra day of rest between starts, with Seattle sticking with a five-man rotation even through off days. Zunino also said the Mariners “pitched a little backwards” with Hernandez at times throwing his curve and changeup early in counts and his fastball later, rather than the other way around, which helped lead to a few of the called strikeouts. But with the way Hernandez was throwing, the order of pitches probably didn’t matter much on a day he improved to 10-2 and lowered his earned-run average to 2.10. On this day, he was almost right. Felix Hernandez hasn’t allowed more than two runs in a game since May 12. Bob Condotta: 206-515-5699 or bcondotta@seattletimes.com. On Twitter @bcondotta.